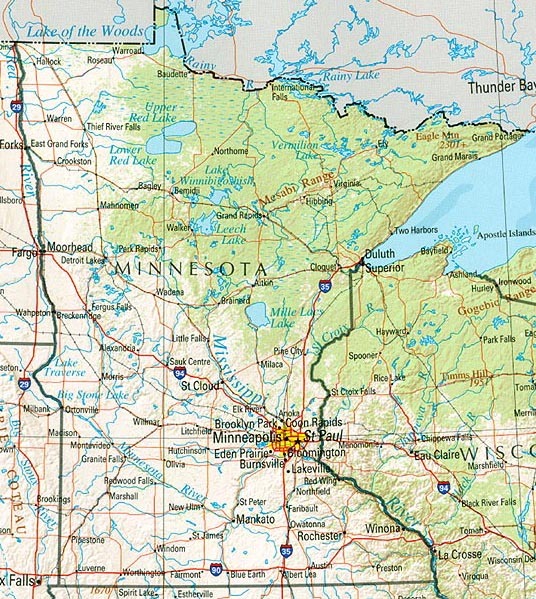 Minnesota is geographically split between the farmlands and deciduous vegetation of the southern regions and the vast coniferous forests and lakes of the northern region. The Mississippi River, whose headwaters are at Lake Itasca in North Minnesota, forms part of the eastern border with Wisconsin. Further north, the shores of Lake Superior stretch up to the border with Canada, a region which has some of the coldest temperatures in the lower 48 states. Known as the land of 10,000 lakes (in actuality there are over 15,000 freshwater lakes in the state) outdoor water recreation, camping and fishing (both in summer and winter) form a large part of Minnesotan culture. Notable lakes include Mille Lacs Lake, Leech Lake, Upper and Lower Red Lake, and Lake of the Woods, which is located on a strip of water and land jutting into Canada. American Indian tribes had long established themselves in the region before the arrival of European settlers, among them the Chippewa tribes in the north, and the Dakota (Sioux) tribes in the south. 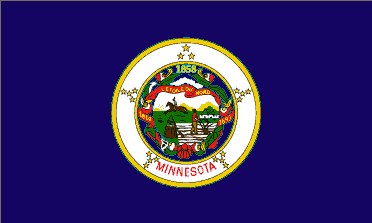 Part of Minnesota was granted to the U.S. after the Second Treaty of Paris following the Revolutionary War, whereas the rest of the state (mainly regions west of the Mississippi) was added after the Louisiana Purchase in 1803. The region remained divided however with the eastern half forming part of the Northwest Territory, and the southern and western areas were incorporated into the Iowa Territory in 1838. Some ten years later the Territory of Minnesota was established, but included much of present day North and South Dakota, extending all the way to the Missouri River. These regions were cut off from Minnesota as it was admitted into the Union on May 11th 1858 as the 32nd state. Minnesota culture is defined by a distinctive Upper Midwest accent, Scandinavian culture and a propensity for kindness which has been dubbed "Minnesota Nice". The state is dominated by the cultural hub of the Twin Cities, composed of the capital St. Paul and the largest city Minneapolis (each roughly located on the east and west banks of the Mississippi river respectively) as well as the surrounding suburbs which extend widely into the Minnesota farmland around. Other important cities include Duluth, a major port city on Lake Superior, Rochester, home to the world famous hospital the Mayo Clinic, and Saint Cloud, one of the fastest growing cities in the Midwest. Minnesota is consistently rated as one of the best educated and healthiest populations in the nation, with the longest life expectancy and the highest percentage of residents with a high school diploma or higher. Minneapolis is also considered one of the best cities to live in, and is notable for its large Somali community (2nd largest in the U.S. behind New York City), vibrant local music scene, and liberal attitudes. Minnesota's economy is dominated by agriculture (in particular corn and soybeans) and manufacturing, with medical equipment and machine manufacturing leading the way. Mining in the north region called the Iron Range has been historically important to the state's economy, but has decreased in activity over recent decades. Home of the first indoor shopping mall, Minnesota now boasts the largest shopping center in the U.S. (appropriately called the Mall of America) which brings in thousands of tourists every year. Minnesota is largely a liberal state, giving Democratic candidates its 10 electoral votes in the last 8 Presidential elections, a current string of Democratic victories longer than any other state. Third party candidates also enjoy wide support in Minnesota, with Ralph Nader receiving the fourth most votes from Minnesota in 2000, and one-time pro wrestler and Reform Party candidate Jessie Ventura winning the governorship in 1998. 20th June 2010	 Im looking into trying to move there next year. So im looking for renters info, guide around this city, and nice areas. I'm also want info providing safe environments for my child, schooling, and jobs availble.